A. Only Agricultural Producers and Processors may sell goods which have been raised, grown, or produced only by the vendor and/or a member of his/her family or apprentices residing in Grant or Catron Counties, New Mexico. Producers/Processors may enlist family members, apprentices, or registered representatives to sell at the Market. All vendors must have the proper permit(s) for products sold. The Market may not have more than 30% Processors, preference will be given to those using local ingredients. B. The Market does not allow the reselling of agricultural products, i.e., any goods not raised/grown by the Producer. Random on-site inspections of gardens or farms will be made at the discretion of the Board of Directors. If it is determined that a Producer has sold any product that he/she did not produce, that Producer can be expelled from the market. C. Producers from Luna and Hidalgo Counties may submit a request to sell at the Market. This request shall be submitted to the General Manager, who will forward the request to the SCFM Board. The Board shall make a determination on each request based on space availability and duplication of existing products at that Market. A. Fresh agricultural products, such as, but not limited to: fruit, vegetables, eggs, meat, honey and bee products, livestock,fresh milk, and wild-harvested herbs. B. Processed products, such as, jams, jellies, pickles, salsa, dips, mixes, cider and juices, dried fruits or vegetables, dairy products, meat products, baked goods, and herbal products. Primary ingredients that are available and grown locally must be procured locally. C. Plants may be sold. Purchased nursery stock must be repotted into a larger container and have been grown by the vendor for no less than 3 months for 1 gallon or smaller pots, and no less than 6 months for larger than 1 gallon pots before they can be sold at the market. There is no time limit on cuttings, divisions or seed-grown plants collected from the grower’s property. SCFM maintains a nursery license that covers all vendors. D. Small livestock, such as chickens or rabbits, may be sold at the market and must have been in the vendor’s possession for no less than six weeks. E. Larger livestock such as goats and sheep may be sold through the use of photographs, and must have been in the vendor’s possession for no less than eight weeks. F. Invitational Artist, one artist/craftsperson will be allowed to demonstrate and sell their original artwork or craft per week, subject to the same guidelines as processors and producers. G. No dogs or cats may be sold or given away at the market. A. Each year each vendor must fill out a SCFM application by their first day of attendance. B. One stall space is 12 feet by 25 to 30 feet, and will be set up as directed by the Manager. C. No vendors will be allowed to drive into the market after 8:00 A.M., but may hand carry their products into the market. D. No vendors will be allowed to move their vehicles before 12 noon. E. The Manager will ring the bell at 8:30 A.M. on Saturday, signaling the start of sales at the market. Any and all sales, trades or giveaways made to customers before the ringing of the bell will be penalized. Sales, trades or giveaways may be made between vendors (including vendors at the Art Market) before opening time. F. Vendors are not allowed to bring pets to the market. G. CSA pickups are allowed at the Market if you are a vendor selling other agricultural products on that day. H. The inclusion of a Community Table, defined as a single stall where several vendors sell their products, is allowed. The Community Table will be administered by its members and follow all of the SCFM guidelines. Table will be available for individuals up to three Saturdays a season, after which point vendors will be charged the annual membership fee. I. Any complaint or disagreement arising from a customer and/or vendor shall be immediately related to the Manager. The Manager has all authority to enforce the market guidelines. Noncompliance of the guidelines will result in a warning. In the case of repeated noncompliance, the SCFM Board has the authority to terminate a person as member, and the member has the right to appeal that decision. No refunds of membership fees will be given. A. WIC and FMSEP are programs that allow pregnant or nursing women and their children (WIC) and seniors (FMSEP) who are at nutritional risk to purchase fresh fruits and vegetables from the farmers’ market. SNAP/EBT is the food stamp program for low-income individuals and families. To participate in these programs vendors must sign appropriate paperwork. 1. WIC coupons may be used for fresh fruits and vegetables ONLY. FMSEP coupons may be used for fresh fruits, vegetables, and honey No change may be given. 2. All eligible vendors must sign a SNAP/EBT agreement. Producers/Processors may accept EBT tokens for eligible food items, while Double Up tokens may be used for fresh fruit and vegetables ONLY. No change may be given. B. Accepting EBT tokens or WIC/FMSEP vouchers for ineligible goods will result in expulsion from the market and possible prosecution under applicable state and/or federal laws. A. Debit tokens can be used like cash, with change given if necessary. The market incurs certain expenses, such as advertising, Manager’s salary, insurance, and nursery permits, all of which are the obligation of all vendors. A. The non-refundable annual membership fee of $10.00 will be collected with a completed application, as well as any penalties from the previous year. B. 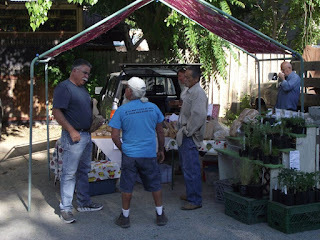 At each Market, a minimum fee of $5.00 will be charged for vendors selling $100.00 or less. For total sales over $100.00, a 5% of total sales fee is required from each Producer/Processor, up to a weekly maximum fee of $15. Board members have the option of receiving a $5.00 discount off of the weekly vendor fee. C. Failure to abide by these guidelines may result in penalties up to and including loss of membership in the Market.